Vasyl Lomachenko comprehensively retained his WBA and WBO lightweight titles after brutally knocking out Anthony Crolla in the fourth round. Lomachenko – regarded as the best pound-for-pound boxer in the world – barely broke a sweat in battering Crolla in Los Angeles on Friday. British boxer Crolla stepped into the ring after IBF champion Richard Commey withdrew from the unification clash due to a hand injury, and the former WBA ruler was outclassed. 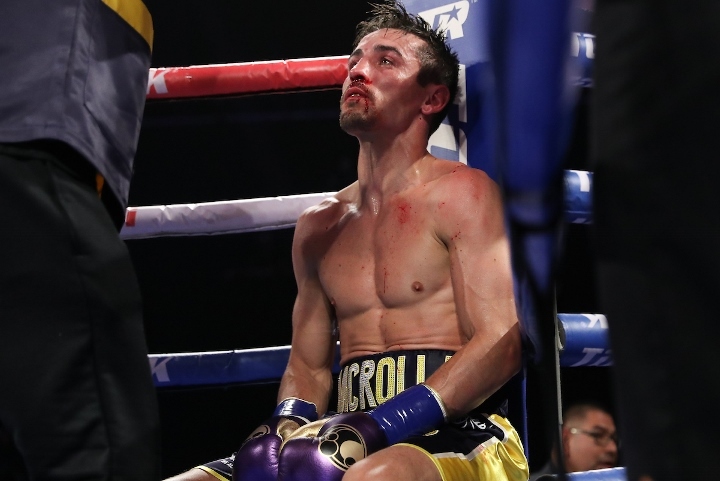 Ukrainian and two-time Olympic champion Lomachenko thought he had claimed his 13th professional win late in the third round following a flurry of devastating punches that left Crolla on the cusp of defeat. Lomachenko (13-1) celebrated – thinking the referee had stopped the fight – but the bout continued as mandatory challenger Crolla met the standing count before the bell sounded. Once the fourth started, Lomachenko continued bust him up and then landed a right hand that put Crolla down on his face. “My pride is a bit hurt, my team put so much effort in with me,” Crolla told Sky Sports. “I’m a bit gutted. I lost to a special fighter, I just wanted to give a better account of myself, but he hit me with a great shot. It’s the first time I’ve been hit like that. As I went down I knew as frustrating as it was, I wasn’t going to beat the 10 count, my senses went everywhere. “I’m just gutted, I got in the best shape of my life and for it to end like that and as early as it did, very gutting. “I knew how his balance was and his feet, he’s very hard to hit, I thought he was very good at angles, he’s a fantastic fighter. “I don’t know, I’m going to have some time to think about it. I wouldn’t really want to go out like that but I’ve banged on about staying in boxing too long. “I love this sport, it’s a big part of my life but I’ve not got much left now, so we’ll see whether we’ve got one more later in the year. “I’ll speak with the team, maybe back in Manchester, I don’t know. I had a fantastic camp and I felt brilliant, so it’s very disappointing. Should Keith Thurman vs. Manny Pacquiao Be Next?